What is your routine at home? What are YOU practicing? It’s hard to give someone a straight answer without addressing a few variables. It can vary depending on a number things including what gigs I’m doing that week. Material I may be required to work up for a future job such as a wedding or solo gig can steer my practice in a completely different direction than say a Rock or Electric gig. If I have a lot of free time between gigs, what I practice may be vastly different than a week when I’m doing 5 or 6 gigs in a row. One thing that never changes is my simple day-to-day technique routine. I’ve tweaked these daily workouts many times over the years and I think I finally have it dialed in for optimal results in the least amount of time possible. I may also change them week to week by adding or subtracting an exercise based on my schedule. It’s entirely up to you how you decide to use them. The important thing is that you’re doing something and doing it regularly. The old adage is true, it’s better to practice a little each day rather than cram in 4 hours on a Saturday. For future reference, I’m putting all of this material into a section in my upcoming book which will include full TAB and Standard Notation for each exercise in its entirety. Tip: Learn the shapes before trying to tackle the full exercises. 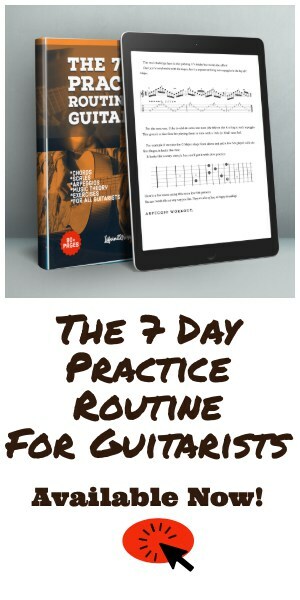 If you’re not familiar with all 7 Diatonic Modes or a group of arpeggios, that’s ok. It will come with time. On days where the material is completely new to you, take that practice day to work on each shape. Spend time on the shapes pertaining only to that day’s practice lesson and gradually you will have committed them all to memory. After everything is memorized you’ll get the most from each days practice session. If you don’t have access to these shapes, join my email list and I’ll send you high quality, printable .PDF files for them all from my FREE Guitar Printables page. I’ll also update you when the final book is finished! There are a few reasons you should always practice with a metronome. The obvious being that it will set a good foundation for your timing. It will help both your rhythm and lead playing, as well as synchronization of both hands. No matter how good you think your timing is, I guarantee you can benefit from using a metronome. Practicing with a metronome also gives you a measurable indication of your progress in each practice session. For example, if Monday’s routine is too hard at 100 bpm, try knocking it down to 90 and work your way back up. A good rule is to increase 1 BPM per day until you’ve reached your comfort zone at a faster tempo. Once a high threshold is reached, start about 10 BPM below that, then use that as your starting point for each days routine. If you’re new to playing with a metronome start with 1, 2 or 4 notes per click. Eventually try to feel each click as a quarter note and you’re playing 16th notes etc, al. When this becomes comfortable you can work on triplets, 6/8 as well as odd time signatures. If you don’t have a metronome, they’re pretty inexpensive. You can even download metronome apps on your computer, tablet or smart phone. Personally, I still love the old-fashioned analog click type Metronomes. We all want to PLAY guitar. 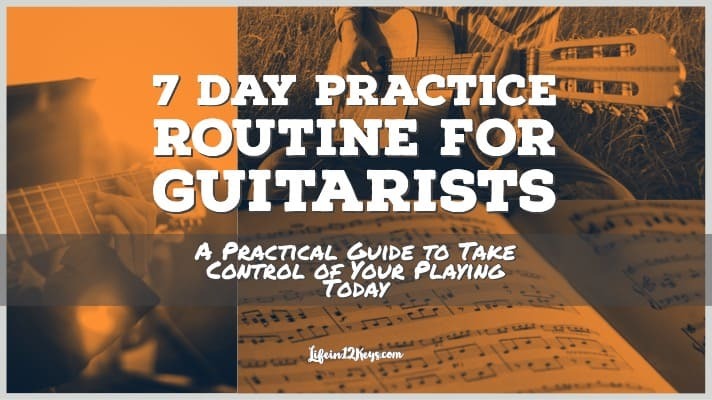 Save some time for playing after you PRACTICE. Always. Regardless of how much time you have to devote to the guitar, try to split it 70/30. Practice 70% of that time, then play whatever you want for the other 30%. I’m in the habit of splitting my guitar sessions into separate afternoon and evening sessions. Typically I do this on my days off. With this mindset, there’s no pressure because I know I had a good PRACTICE session earlier. On days when I have a gig, rehearsal or jam I’ll just do the practice routine so I’m set up to do my best possible playing later. This is the habit you want to develop regardless of how much time you have to practice. Take breaks every 15 minutes or so. Get up, walk around a bit. Don’t play through pain. If it hurts- stop. This one is entirely up to you. From experience I can tell you that you can use either type of guitar for any of the routines. The possible exception being the optional fingerstyle/classical exercises on days 6 and 7 respectively. For those you should try them on a nylon string Classical style guitar if you have access to one… and because steel strings will destroy your nails. 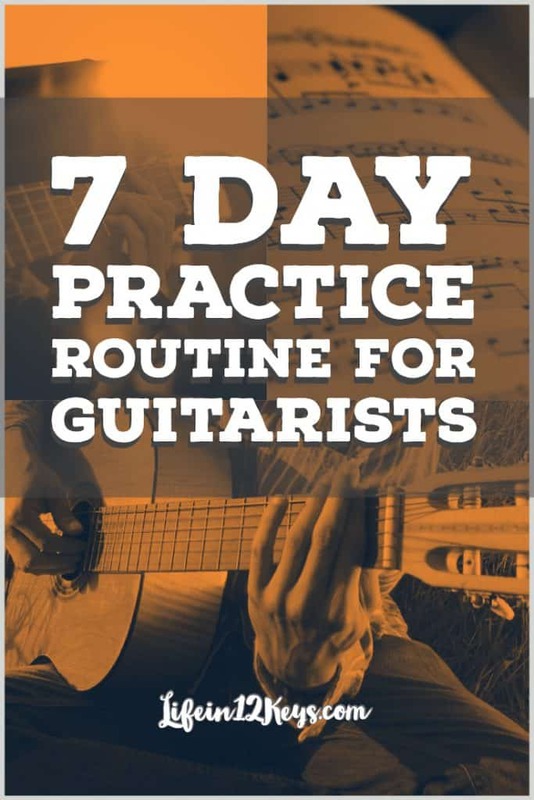 If your preferred practice method is using an electric guitar and an amp, I would strongly recommend alternating days (or even exercises) between clean and dirty channels. For example, if you’re a Rock or Metal guitar player, do Tuesday’s modal routine with distortion and Wednesday’s arpeggios on a dry clean setting with no effects. Next week reverse that. I’d also recommend that those who want to use distortion back the Gain down to a slightly uncomfortable level. Meaning, it should feel harder to play well. When you turn it back up to what you’re used to, you’ll feel that much better. Lastly, this isn’t a Music theory lesson. I will delve more into the theory in the final book. If all of this stuff is completely alien to you I’d always advise working with a good teacher. Also, don’t forget to get on my email list and I’ll send you the shapes. These are crazy simple exercises you can do in front of the TV or wherever you want. No scale knowledge required here. The basic idea is to cover all of the possible left hand finger combinations across 6 strings. At first you may just want to do them in one position. After they feel comfortable, do each sequence up to the 12th position. In the example below I’ve included the 1,2,3,4 sequence ascending & descending using alternate picking (down, up) along with the shift to the 2nd position. When shifting keep the same finger combo (1,2,3,4) and continue up the neck. When you get to the 12th position start over with the next sequence (Fingers: 1,2,4,3.. no that wasn’t a typo: 1-2-4-3). 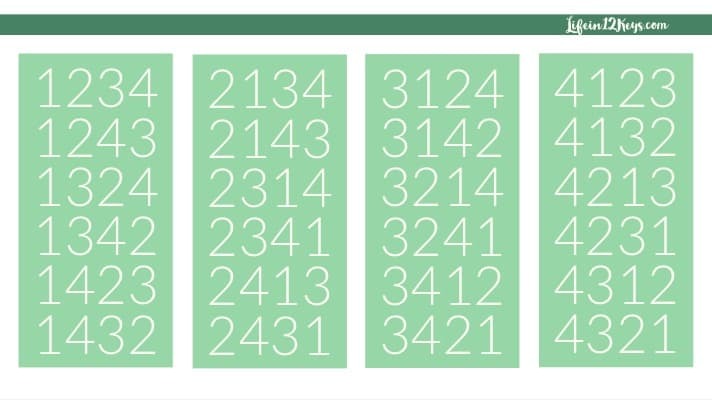 It can take a long time to go through all the sets so alternatively, you could do the “1’s” this week, the “2’s” next week and so on. Time Spent: About 30 minutes if you do one column to the 12th position. Don’t forget to use a metronome! After doing 4 note-per-string sequences I like to change it up to 1 note-per-string picking through chords. I believe there is much more benefit to changing it up this way rather than just running random scales for an hour. You can do this exercise with any chords you want including 4 and 5 note shapes. The number of strings will change the right-hand feel, so change it up! This is a powerful exercise for building good right-hand picking technique. It also helps take away the awkwardness many guitarists feel when playing upstrokes. These really help keep my picking in shape by focusing on one string. They’re very helpful in improving the synchronization of both hands. They’re easy enough a beginner can learn them. 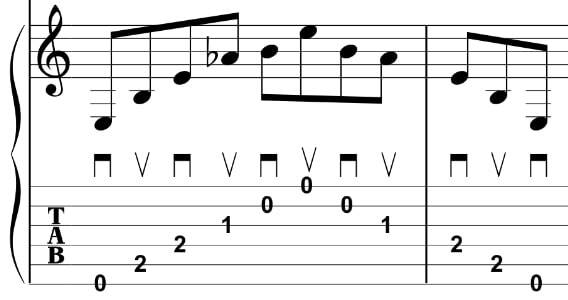 For this example, I’m using the G Major Scale (GABCDEF#G) starting on the first string using the first available fretted note in the scale (F#) in the second position. Find a comfortable speed to play the first 4 triplets before double-timing it for the last 2. This is another great sequence borrowed from Al Di Meola. He does this on just about every record he’s ever recorded. Continue on up the neck diatonically in G Major. The next set would be G, A, B, then A, B, C, etc. until you run out of frets. Flip it around by starting on your pinky and doing them in reverse. A, G, F# then B, A, G etc. You can do them on just one string or all 6, just stay in key. I also like to tweak this by playing the first 4 triplets in 4/4 then switch to a fast blast of 6/8 feel for the last 2. Whatever works for you. Have fun with it! Do a different key every Monday. This is really important. The more different keys you practice in the better for your overall improvisation and fretboard knowledge. So that’s my Monday guitar practice routine. Time to stop practicing and go do some playing! Next time I’ll get Tuesday’s routine up. Tuesday’s Modal Workout is probably the hardest day of the week but gives excellent results for improvising and overall technique. It’s about 8 pages so I’ll be sure to include a link to the .PDF file. 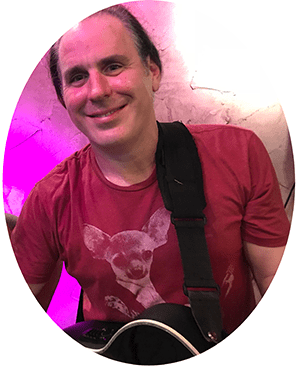 Join the email list to get the FREE .PDF files for the Modal Workout, Pentatonic Major/minor/blues, Melodic/Harmonic minor scale shapes and more right to your inbox! Scrivener: Hands down my favorite app. I use it for all of my writing. Adobe Spark Post: Graphics editing. Simple and fun to use. Jason Becker - Perpetual Burn on Vinyl! 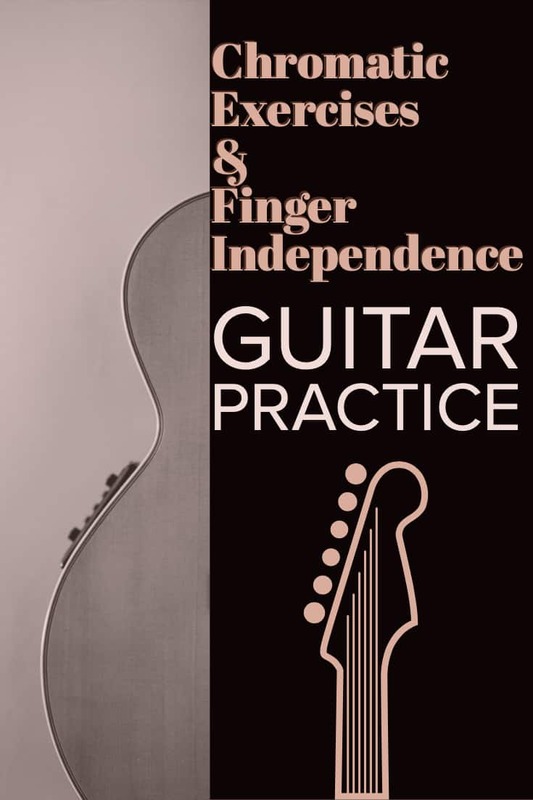 Can I do finger independence exercises, but using legato? That is that I always was doing and all teachers recommended me that. Yep.. I also answered your email in more detail, but yes you sure could. 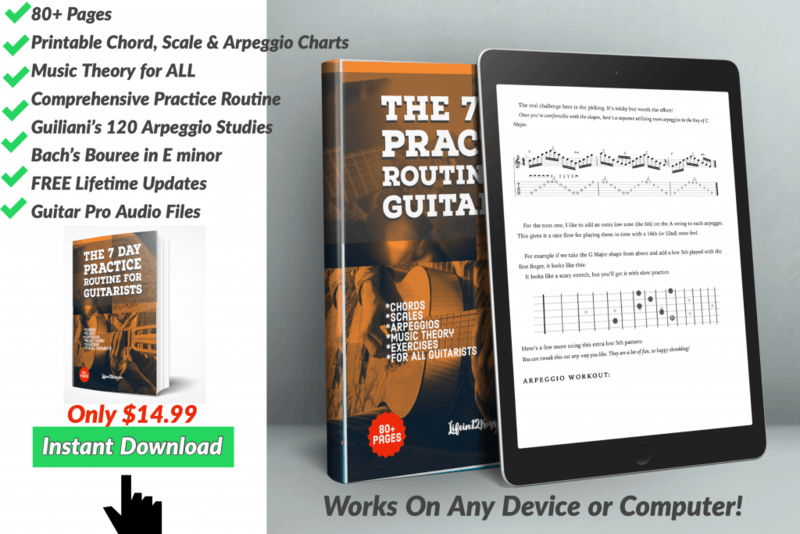 I’ve found these 4-note-per-sting exercises to be more effective for picking exercises.. and the classical slurs in chapter 6 better for legato… but of course you could do either one if you feel it is helping. Thanks for buying the book and keep practicing! Great curriculum! I was wondering, is there anywhere one can go and hear or see the Villa Lobos etude played? I’ve been meaning to make a video of that. I may actually make the whole book into a video course. When I get that done I’ll let you know. If you want to see the original classical style version its all over YouTube.